First of all, let me wish you a very Happy New Year from our little corner of the world. I hope you've all had a fantastic set of holidays! 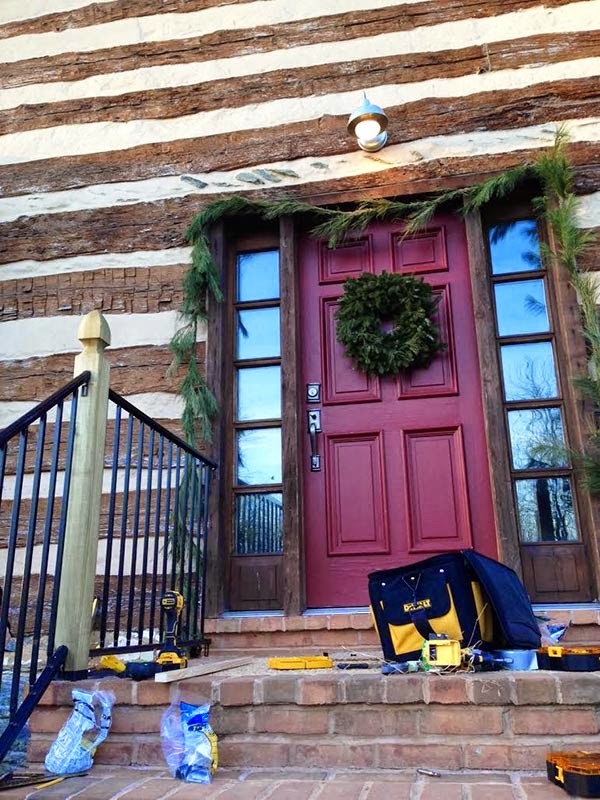 Ours had some highs and lows--one of the lows being a late-night trip to the ER and a diagnosis of croup for Johnnie (who is thankfully feeling 100% better now), and one of the highs being the long-awaited completion of our front porch railing. This railing was such a challenge. (Ez requested that if anyone asks how long this project took us, I should tell them anything but the embarrassing truth.) The brick, selected to match the house's original chimneys, is quite soft, and finding a way to firmly anchor the newel posts without cracking the brick proved difficult. 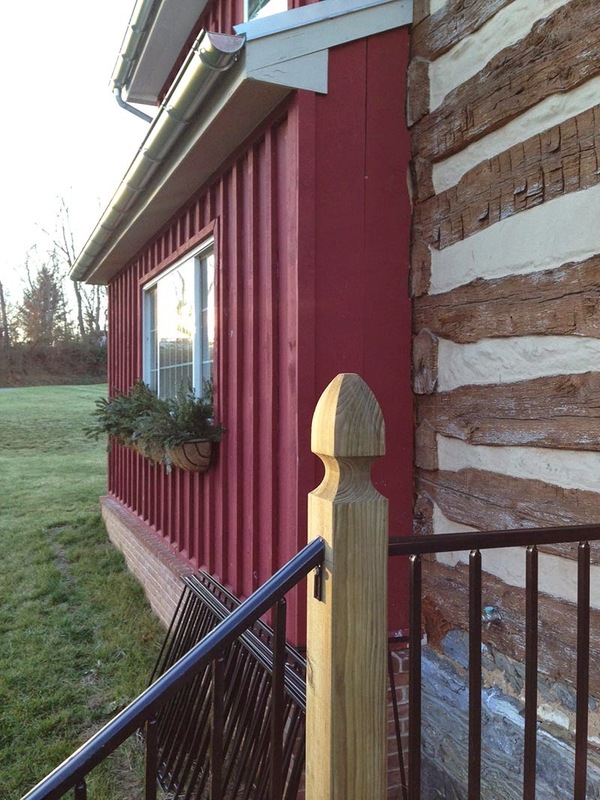 Our first attempt, using the standard black metal newel posts (shown here) that matched the railings, failed because it required sinking four screws for each post, and a few of the bricks cracked during the drilling. As a result, we had to have the brick man come and replace six bricks--this time with one big hole pre-cut into each one. This new method necessitated a different type of post that could be anchored with one long threaded rod sunk a couple bricks deep. Our only option was a chunky pressure treated newel, which we happen to like exponentially more than the metal newels. FYI, all the railing parts were off-the-shelf from Lowe's. Note #1: because this seems to matter more and more to blog readers nowadays, this post was not sponsored and we purchased everything ourselves. Note #2, and a tip: for a project like this one, you really need two people. One person can do it, but two people can do it three times faster. I especially love the window boxes. I was going to just take them down until spring, but instead I chopped up two $4 pine swags and jammed the branches into the soil. Boom. Done. This is not the best photo, but it's my favorite thing. So that's the railing. Can you believe we finished something? It's been awhile since we've gotten to cross a project off the list. Let me tell you, it feels WAY better than falling down the steps. I've been "zillowing" in your state. Wow, it gets expensive near the city. You two (or four) have a nice place with lots of space for what I'm sure was a good price. So what's next? We're hunkered down for low temps here and doing nothing outside. Regardless whether you leave or stay, you have accomplished so much on a project many would not have had either the vision to undertake or the staying power to endure. Can't help thinking your neighbors must be pleased with what you have done. That house reflects so much of the power of vision and hard work. I hope you continue employing those joint creative energies, even if not on that scale or in that type of medium. In a world in which so much is mass-produced or available instantly at the touch of a button, it's refreshing to see creative minds and skilled hands taking an existing medium and turning it into something that is distinctly and uniquely their own, serviceable as well as beautiful. Somewhere in that process--despite the setbacks, sacrifice, and frustrations along the way--you have been building something within yourselves as well that you might not be able to appreciate fully in the moment. I am a process-oriented person who also appreciates the final product, and someday when you look back on this, I hope you will remember: "If life were easy, where would the adventure be?" It continues to be my pleasure to have been a witness to this process and the product as it has evolved. I love how your Plan B turned out! The wood newels look great against the rest of the house, and I think they add so much more charm than metal newels would have added. 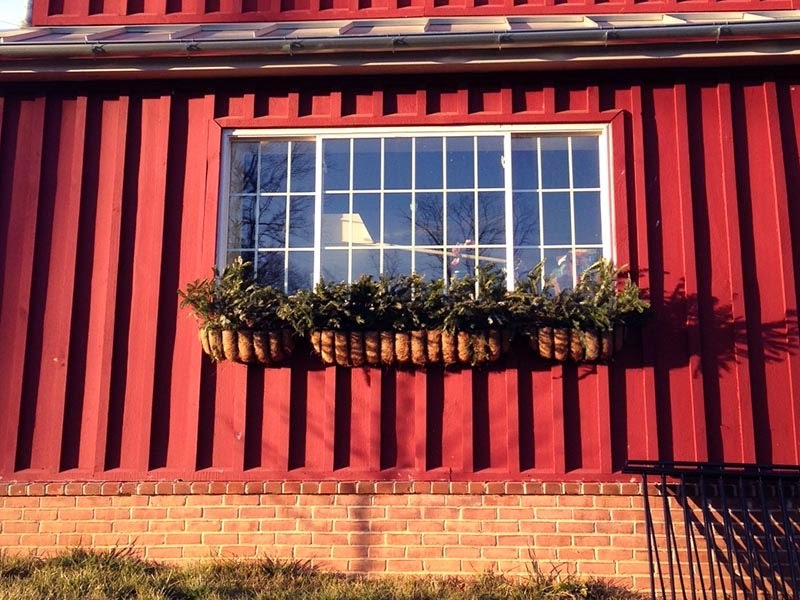 I really like how you added the pine branches to the window boxes...I'm going to have to remember that for next year. 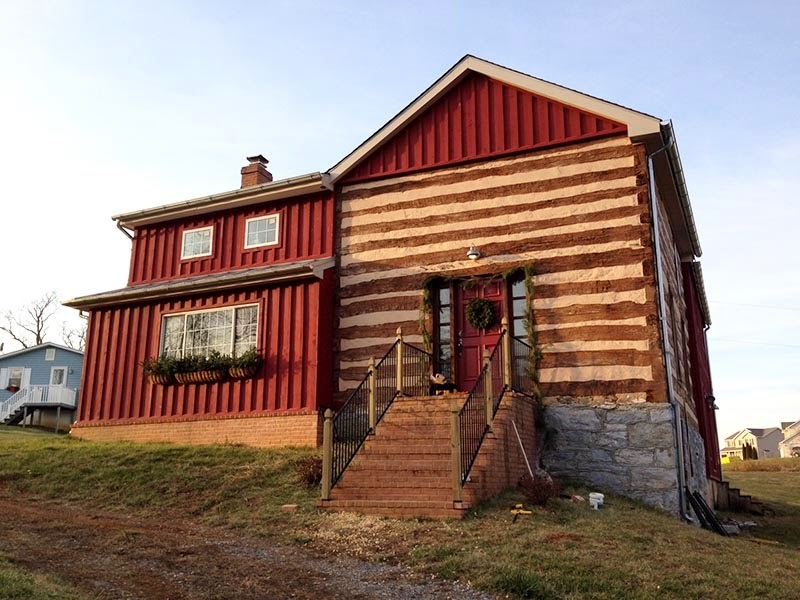 Really enjoy following along on your cabin restoration journey!